Another FANTASTIC BOOK by Peggy L. Henderson!!!! Shan's Burden was a really great book to listen to, and Cody Roberts was once again FANTASTIC narrator!!!!! I thoroughly recommend this book to anybody who loves a story with wonderful characters. It keeps the listener thinking, guessing and truly rooting for Shane! I am very ANXIOUS to listen to book two in this series, which is about Shane's brother Mason. Peggy L. Henderson really knows how to keep a reader or listener totally committed to the story of her characters lives. I loved this book!!!!! Shadow of Shame is a FABULOUS story filled with Romance, Exciting edge of your seat Adventure and Wonderful Christian Values!!! This ABSOLUTELY BEAUTIFUL Book was such a joy to listen to!! After listening to this book I am just filled with emotion and marveling at this author's ability to create such a heartwarming story. I enjoyed the characters and their individual struggles and emotions as the story captured my imagination. Tom Jordan did a wonderful job in narrating this book. His timing and the way he brought each character to life made listening to this book an exciting adventure. Once again Barbara Goss has written a clean Christian romance that I just couldn't put down. She makes everything and everyone in this book give the listener the feeling that you are right there experiencing everything as it takes place! I truly loved this book and I highly recommend it to anyone who enjoys a heartwarming Western Romance that will tug at your heart from beginning to end. A Very Heartwarming and Romantic Story with just a bit of a Ruse!!! I have just finished listening to this wonderful book and I am wiping tears out of my eyes. Good tears, because this was such a beautiful story that filled my heart as I listened to it. 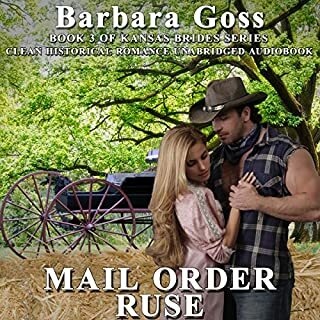 Barbara Goss has again written a story with characters that are so enduring and so real that as I listened I found myself drawn into their world. There was a bit of mystery in the beginning and a tragic past, but this clean romance was filled with Christian values that captured and held my attention throughout the book. I loved this story and each of the characters. It was so very well written and this narrator did a fabulous job of bringing the characters and the story to life. She had a great way of bringing out their personalities as she narrated this story that had every emotion that made this such a heartwarming and romantic story. Thank You again Barbara Goss and Reagan Boggs for this great book that I recommend to everyone who loves a great story with just a bit of a Ruse involved!!!! FANTASTIC Mail Order Bride Action Packed Mystery!! What did you love best about Mail Order Vixen? I loved the characters in this book and the mystery that needed to be solved, as Cole and Abigail got to know and understand each other. Abigail was my favorite character, because of her determination and strength as a woman facing every challenge that was given her. I loved that underneath all her feisty attitudes, she was really a sweet, loving Christian woman. That being said though, I truly enjoyed the other character's interactions with her. This is a FABULOUS BOOK!!! Yes, and I love her narration of this book. She has such a great voice and can make each character come to life!! Listening to her is a joy and once you start listening you have a hard time putting the book down! Yes!! I didn't really want to stop listening once I became involved in this story. It was a very late night once again, because I just couldn't wait to see what was going to happen next. This happens every time I listen to a book written by Barbara Goss. This book was so good and kept my interest until the very last word. Then I had to tell my husband all about it. He loved the storyline and said he thought this book would be a Great Western Movie!! I have to agree!! It had a tragedy, a mystery, and a WONDERFUL good clean Christian romance!! Every character became so real as I listened and I Thank Barbara Goss and her wonderful narrator Reagan Boggs!! I truly recommend this book to anyone looking for a GREAT listening EXPERIENCE that will transport the listener to the old west!!! Where does Mail Order Mishap rank among all the audiobooks you’ve listened to so far? I would rate Mail Order Mishap in the top ten percent of the audiobooks I've listened to in this genre. I really enjoyed the characters in this book. Especially Amber and Garrett. The story was very well written, and it was a good "clean" romance. That is what drew me to this book and this Author from the first. Yes. 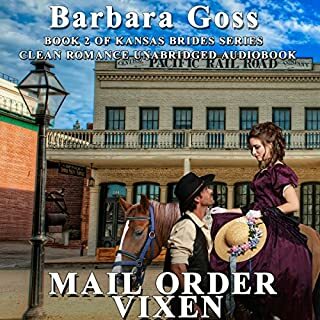 I enjoyed this story and being a fan of western historical novels, I was drawn in to the idea of what it might be like to have been a "Mail Order" bride. Many things could go wrong, or right and this book has really increased my interest in the subject. It has me wanting to read more stories like this. This author did a fantastic job of giving this story a different "twist" by the way she portrayed each character. There was a bit of mystery to fit right in with the normal "angst" that Amber was already feeling, meeting her husband to be. This story was written with a perfect mix of "feeling" and compassion for each of the characters, both the loveable and the "not as lovable" ones. The narrator was very good. She was exceptionally easy to understand and kept my interest throughout the book. She brought "life" to each character, and I found her easy to listen to as she read. I never lost interest. I was very privileged to receive an ARC code for this book from the author. She did not ask me to review the book in return for the code, but I truly did enjoy this listening experience. 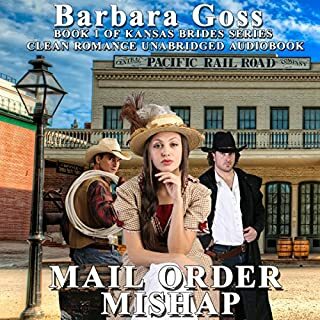 This book was well written and as an avid reader / listener, I feel that I want to let others know how much I enjoyed my listening experience with Mail Order Mishap by Barb Goss. I highly recommend this author and this narrator to anyone who enjoys Sweet Clean Western books. Especially those dealing with the practice of mail order marriages in the Old West of our history. Thank You Barb Goss and Megan Kelly for a delightful experience. Kathryn Ford knows one thing for sure; she will not marry the boring, arrogant man her father has arranged for her since the day she was born, simply as a pawn to enrich his vast holdings. When she discovers she's been disowned for her defiance, the pampered socialite takes her destiny in her own hands. Determined to show her father what a capable a woman she is - without his help or interference - she signs up to be a mail-order bride, totally prepared to give up all the luxuries of her previous life. GREAT STORY.... FANTASTIC LISTENING EXPERIENCE!! YES, I would definitely recommend this book to a friend. 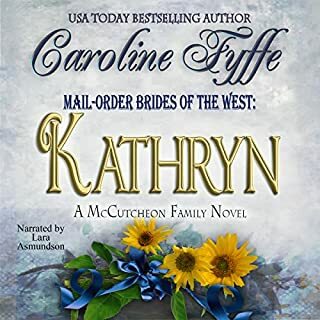 It is a good, wholesome story, with lots of interesting characters..
What was one of the most memorable moments of Mail-Order Brides of the West: Kathryn? When Tobits father came to Kathryn and apoligized for his horrible treatment of her. It brought tears to my eyes!! What does Lara Asmundson bring to the story that you wouldn’t experience if you just read the book? Lara Asmundson brought the characters to life!! Her voice changes to give each character their own special personality. It brought them "TO LIFE" for me. This was my first experience with reading about Mail Order Brides, but IT WON'T BE MY LAST!!!! I loved how the story was so well written, and how it made me feel like I was right there, in that time period, experiencing "LIFE IN THE WEST" during that time period. I really "FELT" moved by the story, as a whole, and It LEFT ME WANTING TO READ MORE ABOUT THESE MAIL ORDER BRIDES!!! GREAT JOB Caroline Fyffe!! I CAN'T WIT FOR MORE BRIDES!!! The Romantic beginning of a FANTASTIC SERIES!! I loved both versions. I REALLY enjoyed the experience of listening to the book, after reading the print version, because the narrator brings the characters to "LIFE"! It made me really realize that just reading it for myself doesn't give the same depth to the characters, and storyline. I really enjoy being able to hear the different "Voices" of the characters. For me, I don't get that so clearly when I do the reading. I am finding that I enjoy being read to. It is a completely different experience, and it is GOOD. TIME TRAVEL!!! It was so exciting, as I have always dreamed of "going back in time" to a time in history that I find intriguing!! Also the setting in Yellowstone. That has been one of my favorite places, since I was a young child vacationing there with family. I also really enjoyed the unfolding Romance between Aimee, and Daniel. Have you listened to any of Alexandra Haag’s other performances before? How does this one compare? This was my first experience with Alexandra Haag. It was a positive experience, and I am ready to hear more from her. She is a very animated narrator, and does well with each character. Leave your "life" behind, and find Love & Adventure in THE YELLOWSTONE OF THE PAST. I was fascinated by this book when it first came out in print, and eagerly have looked forward to each new book in the series. I was "HOOKED" in the first chapter, and I don't think I can ever get enough of the Osbornes in Yellowstone. Listening to it in audible format just gives me even MORE ENJOYMENT!!! Thank You Peggy L. Henderson!!! PLEASE KEEP THESE GREAT BOOKS COMING!! I really like "knowing" more about the lives of these characters. AND I LOVE TIME TRAVEL STORIES!!! 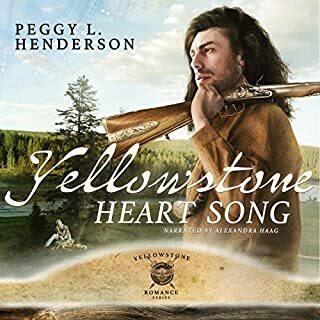 Where does A Yellowstone Promise rank among all the audiobooks you’ve listened to so far? I would rank Yellowstone Promise VERY HIGH among the audio books I've listened to so far. The fact that it continues the story of the Osborne family in Yellowstone, past & present makes it VERY SPECIAL!! I can't seem to hear enough about this family's adventures. 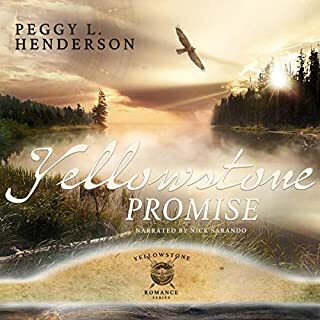 What other book might you compare A Yellowstone Promise to and why? I would compare it with Yellowstone Redemption. Yellowstone Redemption begins the story of Sarah, and Chase, and Yellowstone Promise continues their story. I always enjoy "learning" more about the lives of the characters, and the continuation of "their" story is important to me as a reader/listener. My favorite scene was when Chase was reunited with his mother, and he was able to attain some closure, by knowing that she was going to be "O.K.". I did listen to it in one sitting!! Once I started it, I couldn't stop. Being a Novella, it made it easier for me to just lose myself in it. I really enjoyed listening to this story on audible. The narrater is FANTASTIC!! Each character just came to life! He did a GREAT job giving everyone their own unique voice. Good Job Nick Sarando!! I am so glad that Peggy L. Henderson is giving me more of the Osborne story. I love the characters, and the setting in Yellowstone is SPECTACULAR!!! I can't help but to BEG for more in this series!! Life for Lucas Walker is a constant adventure, a daily game to be won in the vast Teton wilderness. Facing every challenge head-on, he values the freedom to go where he wants, when he wants, and without attachments to any one person. She is known to the native people of the land as Ghost Woman. Hiding from a terrifying past, she has lived alone and under conditions too harsh for even the hardiest men. Trusting another person is something she can't do. FANTASTIC STORY! PLEASE MORE TETON ROMANCES!! What did you love best about Teton Sunset? I really loved the fact that Teton Sunset was a continuation of the WALKER's lives!! It was great to learn more about the Walker boys!! The setting for this book was so detailed, that I almost felt like I was right there!! I really liked all the action, and suspense too. Honestly, I LOVED IT ALL!! Very hard to decide what I loved best!! What was one of the most memorable moments of Teton Sunset? LOVE AND ADVENTURE IN THE HIGH COUNTRY!!!! I loved listening to this book. Each character was narrated with such reality, and feeling, that I felt like I was "right there" in the action!! It was like a FANTASTIC roller coaster ride of Action & Suspense. I was on the "edge" of my seat during the entire book, and I had already read it once before. Audible brings a whole new experience to this story!! I found that I couldn't stop listening!! Now, I am left pleading for more books in this series. Please Peggy L. Henderson, THE WALKERS HAVE LOTS MORE TO SHARE WITH YOUR READERS / LISTENERS!!! I really love the characters, and the beautiful setting of the Tetons. I HIGHLY RECOMMEND THIS BOOK TO EVERYONE WHO WANTS TO GET "LOST" IN A GREAT HISTORICAL ROMANCE!! Naive and spoiled, Sophia Yancey believes she is the only daughter of a wealthy Boston businessman. She's always struggled to fit in among the city's elite due to her dark hair and bronze skin. When a rugged mountain man from the faraway Teton Mountains arrives to reveal her true identity, Sophia is in denial. Joseph Walker made a promise to a dying friend: travel east to find the old Indian chief's granddaughter and bring her back to her people. Unsure whether the girl is even alive, Joseph arrives on the doorstep of Byron Yancey, his only clue to her whereabouts. Romance and Danger in the Teton Mountains! If you could sum up Teton Splendor in three words, what would they be? What was one of the most memorable moments of Teton Splendor? The moment when 'Ravens" grandfather told her she had to marry a warrior in the Bannock tribe, and of course the wedding itself. This was a great continuation of the story I loved in Teton Sunrise. I really enjoy books in a series, as I get very "attached" to the characters, and love to have their story continue. Peggy L. Henderson REALLY KNOWS HOW TO KEEP MY INTEREST, and her books have a GREAT combination of Action, Suspense, And OF COURSE just the right amount of ROMANCE!!! Steve Marvel is THE "BEST" when it comes to narrating a GREAT BOOK!! I LISTENED TO THE WHOLE THING WITHOUT A BREAK IN ONE DAY!!! LOVED IT!! !